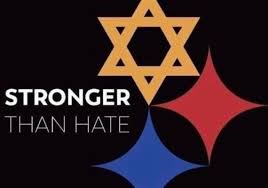 Chartiers Center joins with the Greater Pittsburgh community to recognize that together we are “Stronger Than Hate.” Our thoughts continue to be with all those touched by the events at the Tree of Life Synagogue in Squirrel Hill. Joining with the Greater Pittsburgh community, Chartiers Center shares in the sorrow of the events at the Tree of Life synagogue. As friends of Chartiers Center we wanted to share the following resources for individuals, children and families who may be looking for support during this most difficult time. Please pass along to those in need. The NCTSN also has resources on Psychological First Aid (PFA). PFA is an early intervention to support children, adolescents, adults, and families impacted by these types of events. A training course for PFA is available on NCTSN Learning Center, as well as a Childhood Traumatic Grief Speaker Series. PFA Mobile is an app that can be accessed for free for Apple mobile devices.